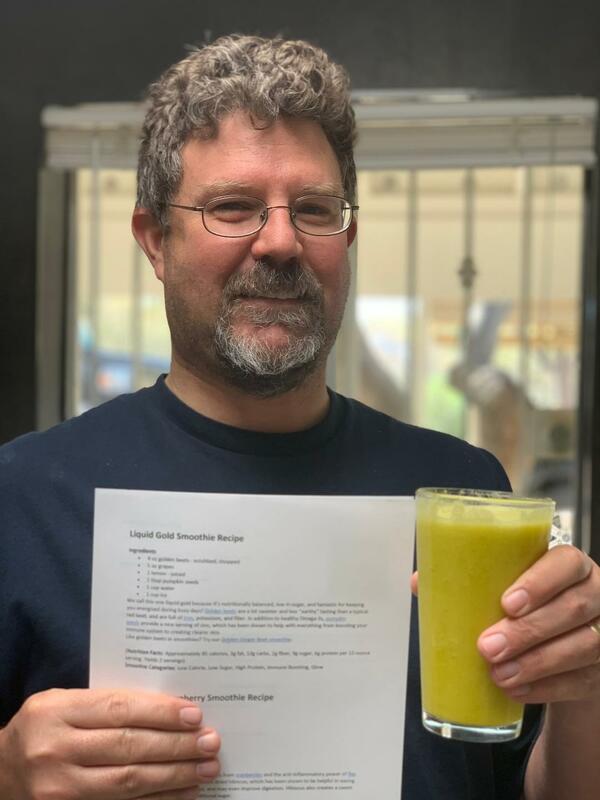 Today Ed used our new Vitamix to make his very first smoothie - Liquid Gold. Made with golden beets, grapes, lemon juice, and pumpkin seeds, the flavor was, umm, interesting. Honestly? It tasted like dirt. But with a slight beet flavor. I don't know what I expected. Beets are root vegetables. They grow up surrounded by dirt. They're earthy. On the second sip, it wasn't so bad. I'd say it's an acquired taste. It could have used a little more sweetness for my liking, but you'd probably get used to it after a while. You can get the recipe here if you're interested in trying it. Tomorrow a Cucumber Cranberry smoothie is on the menu. I feel healthier just typing that sentence.